Good things come in threes - apparently - and this week a very good song debuted on the ARIA singles chart, giving its artist a trio of hits on the top 50 all at once. As well as being her third hit single in Australia, it's my third favourite song she's ever released - and she's released a lot of songs over the years! Meanwhile, Australia still couldn't get enough of "It's Just Not Cricket". The Twelfth Man had the number 1 single in the country for the second week in a row. It might not sound like it, but this track (with a title that is rhymed with "Jaguar") is by an Australian band. From Adelaide, Invisible Mendez only managed this one single. Now their final album (for the time being) was out - and had been to number 1 - there was less incentive to buy this double A-side, which teamed the title track with the Jimmy Barnes-penned "Only One". "Street Dance" had been a decent-sized hit, but the craze for all things breakdance-related didn't extend to this not-quite-as-good follow-up, which featured another whistled hook. Something I never knew: easy-listening pianist Richard Clayderman is French (real name: Philippe Pagès). This recording of the traditional New Zealand tune was his only singles chart appearance. Thank goodness. Break Machine might've had no luck with their second single, but the opposite was true for Rock Steady Crew, who actually charted significantly higher with this follow-up to "(Hey You) Rock Steady Crew". 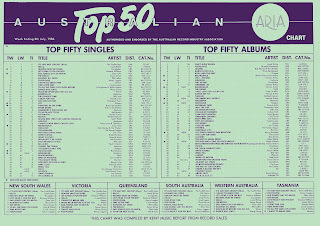 Although that debut single was the much bigger worldwide hit (reaching the top 10 in a bunch of countries), I think Australia got it right with respect to the generally less successful "Up Rock". For me it's the better song and was Rock Steady Crew's only top 10 single locally. Seems every good breakdance single deserves a deathly slow instrumental track... This mournful little number was the theme tune to TV miniseries Reilly, Ace Of Spies, an ITV production starring Sam Neill as the titular spy. 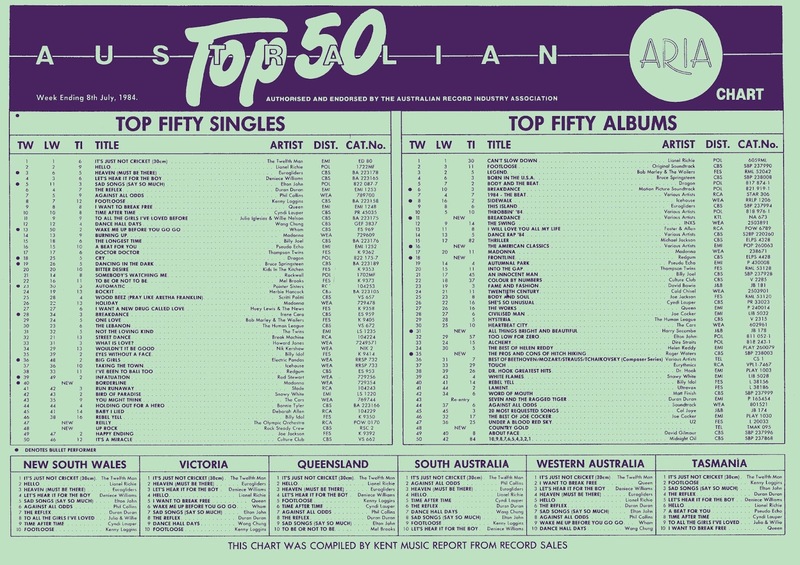 I don't recall the show at all - I'm assuming it aired on the ABC - but it was obviously popular enough to prompt this single's brief appearance in the top 50. Back to a breakdance song? 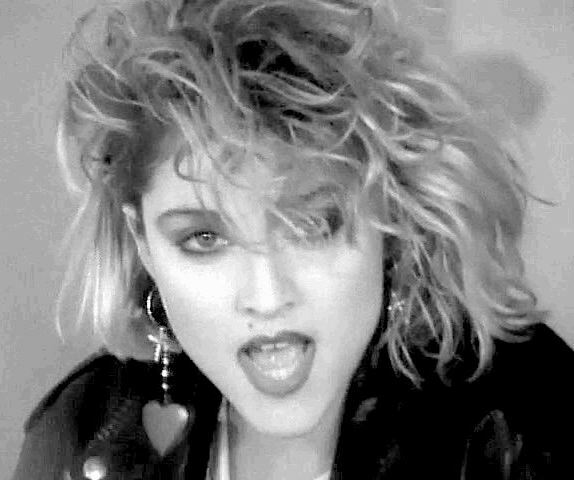 Not quite, but the video for Madonna's third hit does featuring some head spinning and high kicks. While the clip for "Borderline" was on trend in that sense, it was also quite ahead of its time due to featuring an inter-racial romance - not something that received a lot of airtime in 1984. It was a classic tale - girl dances with and dates boy, girl gets famous (and strays) thanks to some fashion photos taken by a sleazy photographer, boyfriend gets jealous, girl realises photographer is a bit of a creep and sorts it out with boyfriend. The song itself was one of two tracks on Madonna's debut album written by producer Reggie Lucas (the other: "Physical Attraction") and speaks of the singer's frustration in her relationship. After party tunes "Everybody" and "Holiday", and the more sexual "Burning Up", the relative simplicity of the song gave "Borderline" quite broad appeal. It became her first top 10 hit in the US and remained on the Billboard Hot 100 for 30 weeks - a tally she wouldn't equal until 1994's "Take A Bow". In Australia, it gave her a third top 15 hit in a row (all of which were on this week's top 50 simultaneously) and, for me, remains the third best song she's ever released. Next week: more music megastars, with debuts by The Jacksons, Culture Club and Prince. Plus, the lead singer of a big American band that never really took off in Australia and the second highest-selling single of 1984 in the UK (by the group that also had the highest-selling one). The eighties were a funny old thing weren't they? As you noted, any given week could see breakdance sitting (or spinning) back to back with pop, novelty records and, this week at least, incredibly dreary instrumental orchestrations. I've never heard more than a few seconds of 'Reilly' or 'Pokarekareana', and don't intend to. I didn't realise Invisible Mendes were from Adelaide, I would have assumed international. I don't mind Break Machine or Rock Steady Crew, they are on the right side of the pop/rap divide for me. Agreed that 'Borderline' sits easily in Madonna's top ten singles, and really should have been top ten locally. Invisible Mendez certainly don't sound Australian. Breakdancing and whistling seems like an odd combination, but I liked it. 'Borderline' is catchy, but I've never cared for it that much. I remember seeing it a few times as music video filler in between TV programs on the commercial stations, though I'm pretty sure this was in 1985-6 rather than 1984. Just discovered your blog, it might destroy my life. Great work!